Baroque Now's "The Bach Album"
is now streaming free on Spotify. Click HERE to hear all 12 tracks including Bach's Brandenburg Concerto #4 for two recorders and two Bach sonatas in their entirety! 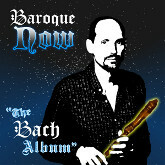 Click here to send email to Baroque Now. All audio and visual elements on this site (c) 2018 RJP.